According to Reuters, earlier this week at a seminar at the Grammy Museum, Mr. Mellencamp made some rather disparaging comments about the Internet. "I think the Internet is the most dangerous thing invented since the atomic bomb," Mr. Mellencamp said. "It's destroyed the music business. It's going to destroy the movie business." John Mellencamp, who has changed his professional more times over the years more often than some people do laundry, has always been known as an outspoken individual. Fair enough, everyone is entitled to their opinions, but to say the Internet has "destroyed the music business" is disingenuous at best. Changed it? Yes, of course it has, but so has every other new technology through the ages. Can you imagine what people must have thought when radio came along in mass use? No longer did you have to buy records to hear music, you could flip a switch at any time to hear it. Then there was the rise of cassette tapes, and the music industry was positive that recording music at home was going to kill off the cash cow. (Last time I checked, it hadn't) When Napster rose up, everyone was again sure that music was going to die and so on and so forth. The music industry, just like any other, evolves over time. Yes, the old revenue models die off, but that isn't anything new. I mean, I'm sorry, but how do you feel the blacksmithing industry feels about what cars did to their horse shoeing business? You get the point, every industry evolves, and if you don't evolve with it, you die. 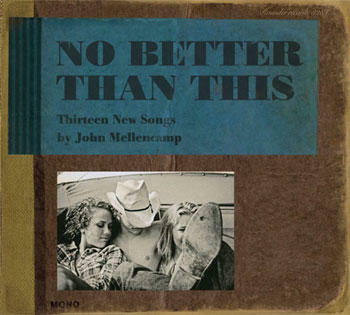 So, apparently Mr. Mellencamp is evolving as his latest album, "No Better Than This", is available for digital download, but even that doesn't satisfy him. When speaking of digital file quality, he spoke of an experience of listening to a remastered CD of The Beatles, and then hearing it on an iPod. "You could barely even recognize it as the same song. You could tell it was those guys singing, but the warmth and quality of what the artist intended for us to hear was so vastly different." Apparently Nothing appeases this guy. The moral of the story is that musicians, like the industry they are in, must evolve to stay relevant. Hanging on to outdated modes of thinking will do neither them, or their fans, any favors. Yes, we all know MP3s are not the perfect medium for music, but they are convenient and relatively cheap. We can also buy them ala carte, so no longer do we have to buy a whole album to get that one good song. And that's the rub, isn't it? It's the fact that we are no longer forced to listen to sub-par music, so instead of selling us an entire album where only a quarter of it is worth anything, we buy those few good songs, and the rest of it rots on the vine like it deserves. So instead of getting royalties for selling us an entire album, you only get money for a couple songs. Well, a wise man might think the solution would be, you know, making better music, but apparently that alludes people like Prince and Mellencamp. If you can't keep up, get out, but whatever you do, just stop opening your mouths and making yourself look like fools. As for me … I'm going to worry about defending myself against Zombie Welk. What say you? Are you musicians just out of touch with the times?